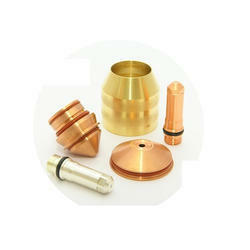 Hypertherm Plasma Consumables,Hypertherm plasma spares,Hypertherm Plasma cutter. 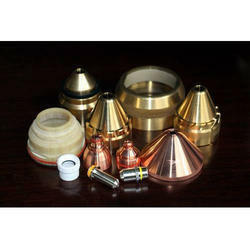 We are one of the most coveted manufacturers and suppliers of this Hypertherm Plasma Consumables Pmx 65, 85, 105, 125. 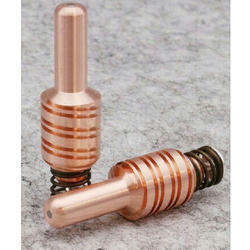 In this product range we offer various kinds of spare parts of plasma torches. 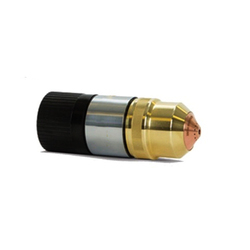 Customers looking for optimum parts and specific models can easily avail these from us at comprehensive prices. We take guarantee of complete quality as we have incorporated the best quality material in the making. Owing to our industrial expertise, we have been gained wide appreciation from our persistent customers for the quality and compatibility of this range of Hypertherm Plasma Cutter Parts. This whole range has been prepared for fulfilling the variegated purposes of our customers involved in sheet metal cutting. 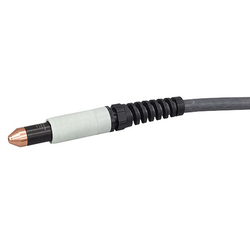 We offer dimensionally accurate and robust consumables that are easy to fit in with all types of plasma torches. 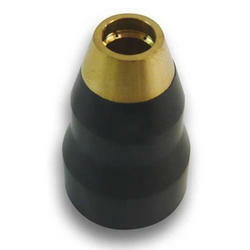 In this range we particularly have a number of hyper therm plasma cutting nozzles of different grades available with us. We are an accredited manufacturer and supplier unit of an exclusive range of best quality-approved Hypertherm Plasma Consumables. 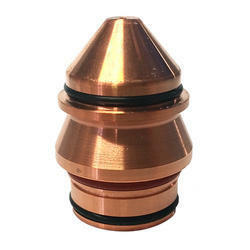 These consumables are widely applicable in plasma cutting torches and systems. Offered to the customers at the most comprehensive prices, these consumables are made from high quality material. 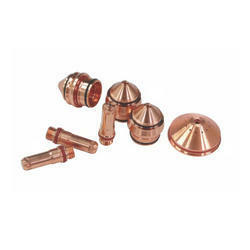 Hypertherm Nozzle 220941, 220819, 220816, 220990. APH make plasma parts suitable for Hypertherm Powermax 65 Torch Parts with 50% less price. 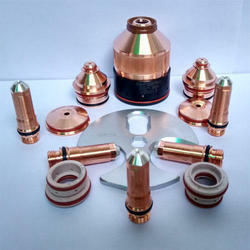 We are offering to our customers this high quality range of Hypertherm Genuine Consumables, Hypertherm powermax 45, 65, 85, 105 consumables, Hypertherm plasma Consumables, Plasma Consumables Hypertherm The offered plasma torch part has been made from the best quality copper and other materials. Customers can avail from us these products at reasonable prices. Appreciated for optimum performance and durability, these products are widely demanded in various industrial applications. Owing to the immense experience and a competent team of personnel, we are able to offer a comprehensive range of Hypertherm Plasma Consumables PMX 30. These products offered by us are made utilizing superior grade raw material and innovative machinery in adherence with the international quality norms and standards. Along with this, the offered range is checked on different parameters to ensure that flawless products are delivered at clients' premises. We have stringently fabricated this high quality range of various kinds of Hypertherm HPR 260 Consumables. The offered consumables are perfectly compatible with the plasma arc cutting equipment. It is their dimensional accuracy and the quality or the grade of the metal that makes it so resistant to highest inert gas temperatures while the process of cutting is taking place. Ours is a firm widely engaged in the process of manufacturing some of the best quality Hypertherm Torch Consumables. The offered range has been made from high quality metal alloys that have been made as per the predefined standards of the industry. 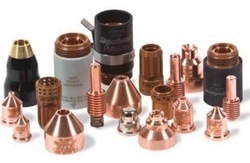 In this whole range we offer a number of consumables that compete the plasma cutting process. In order to meet the assorted demands of respectable clients, we are able to offer a supreme range of Hypertherm Powermax 1650 Consumables. 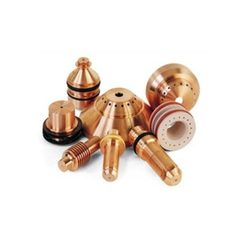 The offered range of torch parts is available in variegated specifications and forms in accordance with the emerging requirements of honorable clients. This range is designed and developed utilizing innovative machinery and sophisticated technology in tandem with the quality norms. 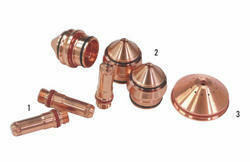 We supply all types of B and Bartoni Plasma Consumables. Such as Powermax 45, 65, 85, 105 etc. Looking for Hypertherm Plasma Consumables Parts ?